Weigl takes readers on a journey to Vietnam in the late 1960s and explores the anxiety he feels as a soldier in a strange nation. Each poem’s narrator carefully observes his surroundings, detailing the corner laundry, the hotel, the jungle, and his fellow soldiers. Song of Napalm chronicles the narrator’s transformation from boy to soldier to terrified man in the jungle and recovering killer. In a way some of these poems contain a dark sense of humor about the war, which probably kept the narrator sane. shaping their calligraphy of wings. and ivy keeps the door from fully closing. above the carved faces for incense. even the place of prayer, is clean. as though to us and not to us. and tells us to move out. curious about what he is saying. wired between his teeth and the floor. burst off the walls into the jungle. Weigl’s dark humor permeates these pages, but it is more than the humor that will engage readers. It is his frank lines and how the narrator tells readers the truth about the situation. From “Elegy,” Weigl says, “The words would not let themselves be spoken./ Some of them died./ Some of them were not allowed to.” There are just unspeakable atrocities that happen in war, and soldiers who return home may not actually return home resembling who they were before they left. Song of Napalm is a frank discussion about becoming a man in a time of war, dealing with the horrors of killing and worrying about being killed, and returning home to a world you don’t recognize and trying to reinsert yourself into the society that sent you to war in the first place. This is my 3rd book for the 2010 Vietnam War Reading Challenge. This is my 17th book for the contemporary poetry challenge. 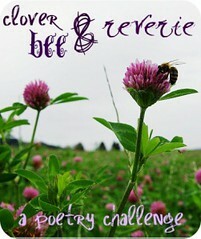 This is my 5th book for the Clover Bee & Reverie Poetry Challenge. 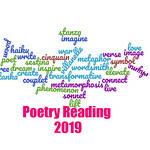 Please also remember to check out the next stops on the National Poetry Month Blog Tour at Online Publicist and Boston Bibliophile. TODAY is Poem in Your Pocket Day! What poem will you be reading? What an incredible cover… wow! I have no poem that I am reading today but perhaps I will listen to one, since I found this very cool site which has a poetry archive of audio recordings by the author. Thought it would be relevant to your April theme here and your blog. Hopefully you have not already heard of it. .-= Shellie – Layers of Thought´s last blog ..“Steam Punk” Preview: The Dream of Perpetual Motion by Dexter Palmer =-. I have not heard of this site before, but it sounds like a great idea to me. It is perfect for National Poem-in-your-pocket Day! .-= Anna´s last blog ..A Prayer Request… =-. Good word to describe this collection. I had an afterthought today that this collection moves like napalm, in that it falls to the earth, crashes into a ball of flame, and then dies out slowly as a sense of calm returns to the narrator. This sounds so heartbreaking and the cover just terrifies me.